I’ve put together a list of Frequently asked questions that we get at schoolyearbooks.ie, Hopefully they can answer any questions that you might have, If you can’t find the answer that your looking for here just drop us an E-mail and we will be happy to help. Q: How much will it cost to print our yearbooks? When you finish designing your yearbook and a Principal or Teacher has provided written sign off, production and delivery takes approx. 10 working days. Q: What size are the yearbooks? All of our yearbooks are A4 size. All A4 inside text and photos pages are printed on high quality 160gm paper and the soft covers are printed on 300gm card and gloss laminated for extra durability. We have three binding options to suit your needs and budget. Perfect binding is the most popular binding method. The pages are glued into your cover. For perfect bound yearbooks the only criteria is you must have a minimum of 70 pages. Q: Can I draw a picture and put it on the cover. This option is not available at the moment with the current cover designs. If you want to put a scan of a hand drawn cover on your yearbook just email it to us along with your OLB number once you have placed your order and we will make a cover for you based on that. Q: Some of the covers at the moment say 2016 will this come out in printing or will it say the current year. This is just how they look online at the moment (We are working on getting them changed). When they are going to print we will change them to the current year. Once you have placed your order you will be take to a payment screen. The full amount must be paid at this point before your yearbook will go to print. Q: Are there any discounts available for order over 100 books? Discounts are not available on yearbooks as we already have our pricing set quite competitive for the high quality product that we produce. Q: What are the dimensions for the two photo profiles as our photographer is going to fit the photo’s to the size we need. The small photos on the layout they are using are 52.5mm square. At 300 dpi that’s 620 pixels by 620 pixels minimum, but larger is ok too. Q: how to delete pages as there are extra pages in our book we don’t need? 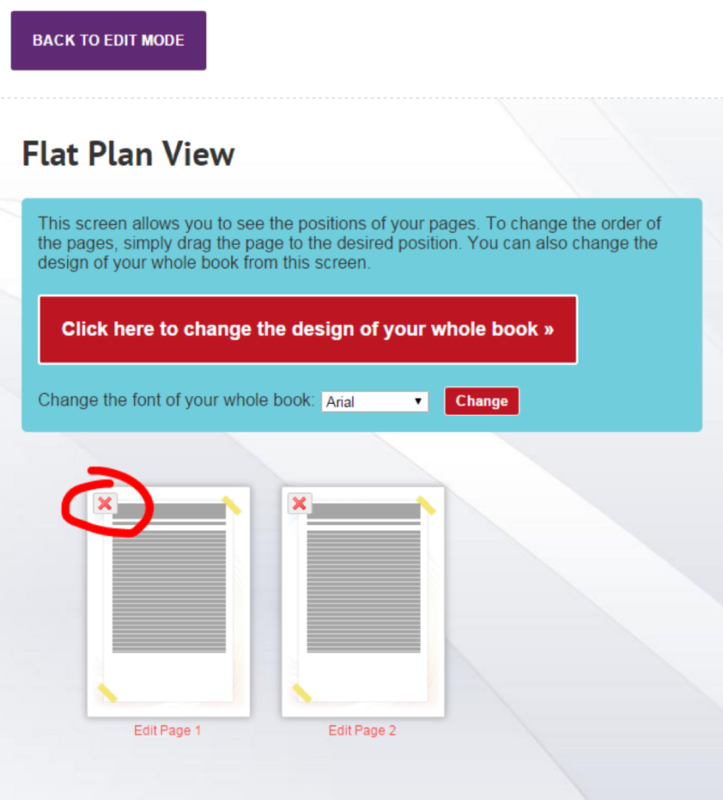 To delete pages, go to Menu and Help > View a flat plan. Pages can be deleted and moved here (see below). Q: If I don’t put a photo in a picture frame will the box come out on the final print. No,The empty box will not show on the final print. You will just see the background of the page as if there is nothing there. You can download a PDF proof at any time to see how this will look. Q: Regarding the text boxes – how many characters are allowed per text box? 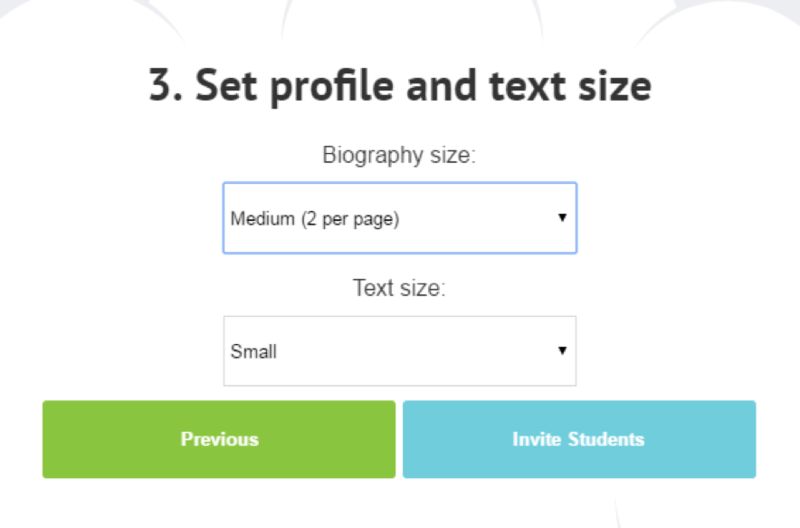 If you are using the invite students feature, you should set the text size to “small” initially and then adjust when all the text has been imported. Safer this way. Text should not run beyond the outlines boxes, if it starts running beyond these boxes the programme will automatically make the text smaller so keep this in mind if you want all of your text to be the same size.